April 23rd marks St. George’s Day, the patron saint of England and one of Christianity’s most famous saints. He is also the patron saint of Portugal, Georgia, Romania, Russia, Ethiopia, Lithuania and Greece and the hero from the George and the dragon tale. St. George’s Day was as widely celebrated as Christmas until England united with Scotland on 1st May 1707. Recently, there has been a push to make the 23rd April a national holiday. 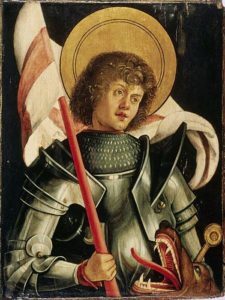 But who was St. George and why do we celebrate him? Little is known about St. George, but he was believed to have been born in Cappadocia, an area which is now in Turkey in the late 200’s AD. Following in his father’s footsteps, he became a soldier, and fought with the retinue of the Emperor Diocletian. The emperor ordered the systematic persecution of the Christians, to which George refused to take part, becoming an early Christian martyr in the process. As his punishment, he was dragged through the streets and tortured before being beheaded on 23rd April 303 AD. St. George is buried in the town of Lod in Israel. 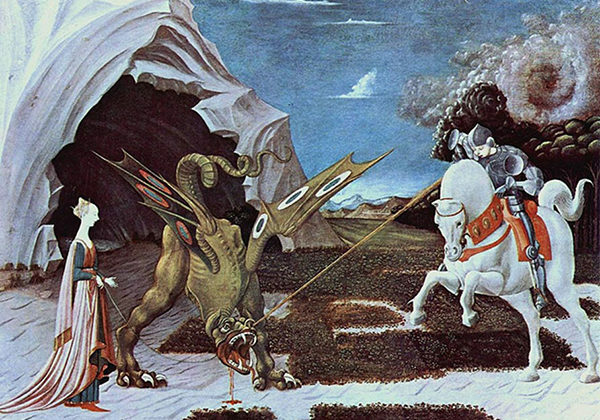 During the 12th Century, the popular story of St. George and the dragon rose to fame, even though it was many years after he was believed to have died. The story has many different versions but they all follow the same basic plot. A savage dragon was terrorising a village in Libya, demanding the villagers sacrificed a sheep each day to him. When all the sheep had been killed, his demands changed to a young maiden. Each day a young girl was lost to the dragon until there was only one left. Upon hearing of the beast St. George travelled to Libya to slay the dragon and free the villagers. He arrived to see a procession headed by a young princess on her way to her death. He caught up and demanded the princess returned to her castle and ventured onwards to meet the dragon. The dragon heard his horse’s footsteps as he approached and greeted with a roar louder than thunder. As the battle began, St. George’s tried to stab the monster but his spear broke into a thousand pieces on the dragon’s scales, throwing him to the ground in the process. As George recouped his energy, he swung and pierced the dragon under his unprotected wing bringing it to ground dead. As a thank you, all the visitors converted to Christianity and built a church under his name.